Intel recently ran an internal marketing conference, where a research firm shared with us a dozen or so technology trends, each with potential to “disrupt” our business. To narrow down discussion about these trends, we were asked to “vote” on which of these trends we thought were most important. And then we could focus our attention on those. While the conference ended up being interesting (maybe more for the networking than the content), I left wondering things like why voting would matter for determining the consequences of future shifts on our markets. And I left wondering about the kinds of insights work we need to produce in corporate environments and the deep challenges we face in producing those insights. In my previous life as an academic sociologist, insight really means a search for foundational causation and theory. For academics, foundational theory matters so much more than discovering the “next big thing.” Moreover, one can be a successful academic by doing all root-cause discovery, with almost no attention to pragmatic problem solving. In my current life as a researcher at Intel, it may be interesting to find deep answers to foundational questions, but more importantly, the work needs to be useful. This is not a new tension. In organizational sociology we sometimes talk about it (following the work of James March) as the tension between exploitation and exploration (March 1991). It is the tension between making use of existing opportunities, often via increases in efficiency; and exploring ambiguity and complexity in the marketplace, where more information is not necessarily effective in deciding what to do next. Straight-line projections from present conditions will get you a CAGR and a TAM (that’s cumulative annual growth rate, and total available market). But this type of forecasting is, I would argue, something different from what I mean when I talk about insight. Too often, these projections substitute real understanding for expediency; and too often, the hit-and-run style of research that characterizes corporate ethnography runs the risk of doing the same. Here, I want to explore a case of pragmatic problem solving substituting for systematic search for foundational causation. Arguably, this happens all the time, as the insights community (as they call it here at Intel) becomes increasingly impatient with understanding what’s coming next. The questions, “What should we do right now? Next quarter? Next year?” with their actionable answers and their relatively clear effects on the corporate bottom line, are compelling questions with valuable answers. But I’d like to use a historical example to demonstrate some shortcomings of this approach. In fact I’d like to talk about lemons, and limes. And scurvy1. Scurvy is a deficiency disease characterized by abnormal bleeding, loosening of teeth, edema, fevers, and eventually, death. What makes scurvy interesting (did I mention the teeth, fevers, and death?) is that it was identified and “cured” as early as the mid-18th century. But then this cure was repeatedly found and forgotten, for almost 200 years. Scurvy plagued sailors and soldiers, and then it was cured; then a century later it came back to plague polar explorers and affluent babies, and had to be cured all over again. Unlike our current epidemiological crises, with adaptive super-bugs and morphing viruses, scurvy had not changed. We had. Scurvy had been identified during the earliest European maritime exploration. Vasco de Gama recorded cases of it as early as 1498, and he also recorded his successes in treating scurvy with lemons and oranges (Lemons and oranges. That’s going to be important later). In 1535, the explorer Jacque Cartier published detailed accounts of scurvy and a curative spruce leaf and bark extraction that friendly Native Americans provided (Martini 2002). However, information about the disease and its cure did not spread in either of these instances. Long, exploratory, sailing voyages continued to contended with scurvy through the mid-18th century. It wasn’t until 1747 that James Lind had conducted a clinical investigation of scurvy, including relatively controlled trials of fresh citrus (lemons and oranges). Significantly, Lind’s solution was a pharmacological one, rather than a nutrient one. That is, the experimental evidence about scurvy and the preventative effectiveness of citrus was a practical solution without explanatory causation. Following his advice, in the 1790s the British Navy fairly abolished scurvy by requiring ships to carry lemon juice. It seemed as though scurvy was a “solved” problem. Adding to the puzzle, scurvy had also begun to appear as a new disease among infants of affluent families in the US and Europe. New technologies of pasteurization and public health increased dramatically the use of infant formula (and breastfeeding was rendered into something the lower classes did). No one could see that pasteurization was rendering useless milk’s vitamin C in the new infant formulas. In 1910, nearly 400 years after scurvy was first “cured,” the ill-fated Scott expedition to the South Pole also suffered from scurvy. The expedition’s Royal surgeon, Edward Atkinson, subscribed to a bacterial theory of scurvy, and Scott was convinced that poisoned, tinned meats were the cause (Cherry-Garrard 2013). The lime extract they carried was ineffective in preventing the disease. 1) Theory. Theory about scurvy was incomplete, and then wrong. Despite the empirical evidence that citrus fruits (among other diets) prevented scurvy, “the belief that the citrus fruits were replacing a missing dietary component would have been alien to medical thought at the beginning of the nineteenth century” (Cambridge World History of Food). Absent a conception of vitamins, contemporary science was left with incomplete causation for scurvy. Making things even more complicated, the germ theory of disease was firmly established by the mid-19th century, and a version of this theory was favored by royal doctors as late as 1910. Theoretical models, then, favored a conception of scurvy as a bacterial disease rather than a deficiency disease. Absent a correct causal mechanism, practitioners were instead dependent on “what worked” from experience. 2) Specificity of language. One of the most intriguing reasons why limes “lost” their effectiveness in treating scurvy was that what a lime was through 1850 was actually different from what a lime was by the 1870s (Smith 1918). 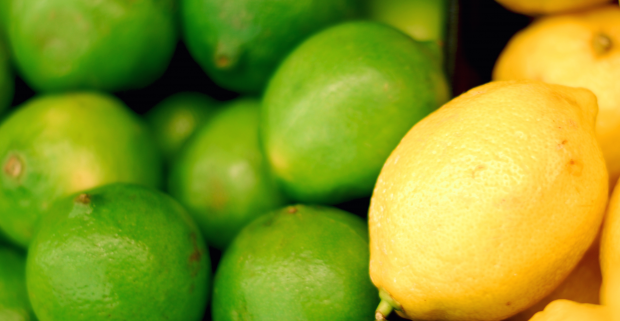 In the earlier period, lime juice actually referred to the juice of Mediterranean lemons (primarily Spain and Sicily). Development of British lime production in the West Indies by the 1860s meant that the British Navy could produce limes cheaper and with more control over their cultivation. But it turns out that the West Indian sour lime has about one-quarter the vitamin C of the Mediterranean lemon. Because they were both referred to as “limes,” no one realized that this distinction might make a difference. Then these limes were reduced by “almost boiling” and purifying them (Baron 2009: 320), creating an essence that would resist spoilage. However, it would also not prevent the disease, as the heat would render the ascorbic acid ineffective. And so, less vitamin C-rich limes were reduced to lime syrup; the concoction was ineffective; and limes suddenly lost their power to prevent scurvy. Which no one noticed, until the Antarctic explorers and affluent babies started getting sick from it. It was, in retrospect, good for Gimlets. 3) Changing contextual conditions. But even without a correct theory of causation, the treatment of scurvy should have rendered it obsolete. And it appeared to do so! The British naval requirement that lime juice was to be distilled into sailors’ rations of drink was effective in eliminating the disease. Sort of. In actuality, the preventative measures were increasingly ineffective in preventing the disease. But no one noticed. They did not notice because the long voyages that characterized the 18th century sea explorations were replaced by shorter, faster voyages by steamer ships. The Restauration, an 1825 first sloop to carry Norwegian emigrants to the United States, took 12 weeks to arrive. The first steamships took four weeks. Soon, the twelve weeks became 16 days. Political scientists theorizing forms of institutional change sometimes talk about “drift” – the fact that institutions need to be refocused, sometimes recalibrated, in the face of changes in the political and economic environment. In the context of corporate research, insight also needs to be recalibrated in the face of changing contexts. There is a danger that poorly-understood, incomplete theories of the world stick around because we assume they are still working, even when they are not. The story of scurvy is a reminder of the importance of insights work and doing it correctly. Ideas based on quick polls (or, closer to home, two weeks of ethnography), or voting, or any truly superficial analysis, won’t necessarily help us understand roots of problems. Nor will that kind of work suggest courses of action to take. They can either lead to wrong cures for the ills of our companies and clients, or they might lead to cures that don’t work in the circumstances in which our clients and companies find ourselves. Complicating this further, companies and clients are under increasing pressure to act quickly or continue the same action they’ve done in the past. Efficiency and exploitation have been found to consistently crowd out less efficient, exploratory projects. To have successful voyages, and avoid being plagued by problems, compelling cases need to be presented about ethnography turning lemons into lemonade. I am curious what problems you think we have solved-but-not-solved, with incorrect causes, occluded by context and nomenclature, awaiting the discovery of vitamins? 1 The inspiration, and synthesis, of the scurvy story comes from Maciej Cegłowski‘s brilliant post on Scott and scurvy. Baron, J. H. 2009. “Sailors: scurvy before and after James Lind – A reassessment.” Nutrition reviews, 67(6), 315-332. Cambridge World History of Food. Cherry-Garrard, A. 1922. The Worst Journey in the World: Antarctica, 1910-1913. London: Constable and Co. Ltd.
March, J. G. 1991. “Exploration and exploitation in organizational learning.” Organization Science, 2(1), 71-87. Martini, E. 2002. Jacques Cartier witnesses a treatment for scurvy. Vesalius, 8(1), 2-6. Smith, Alice Henderson. 1918. “The Relative Content of Antiscorbutic Principle in Limes and Lemons.” Lancet Office Nov. 30: 735-738.